I have instant love for l’Eau de Chloe, the latest version of the original Chloe eau de Parfum. I have another version, the Rose Edition (see the Chloé Rose Edition Review here) but I don’t like that anywhere near as much as the new one. I loved it before I had even sprayed it – I took off the lid and the scent of roses hit me instantly. (We all know how much I love Rose-Scented Products!) I had a moment of near-dislike when I first spritzed it as it seemed overpoweringly citrussy, but very quickly it mellowed out into just the most divine, delicate scent. l’Eau de Chloe reminds me of something from my childhood and I’m having trouble pinning down what it is. 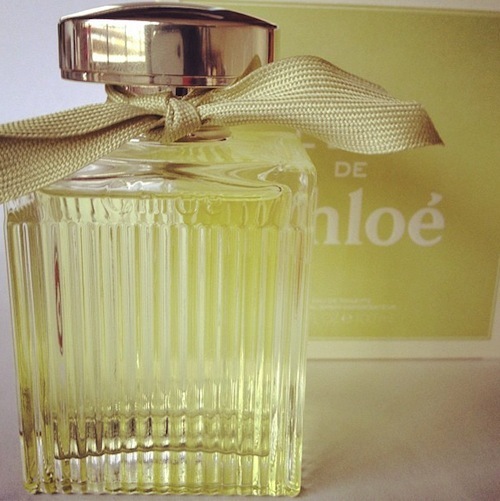 I used to have a selection of solid perfumes (they had come with some kind of Flower Fairies set) and I think that one of them may have been quite similar to the Chloé fragrance. The beautiful smell of rosewater and the soft citrus is a perfect blend – there’s nothing shocking or dramatic about it, but it’s easy to wear and incredibly pretty. The bottle is a bit of a gem, too. Heavy, slightly deco-inspired, with the pale green perfume inside – I’m just absolutely smitten!